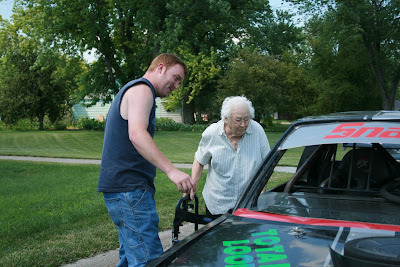 John Miller explains the finer points of a race car to Wilma Cox. 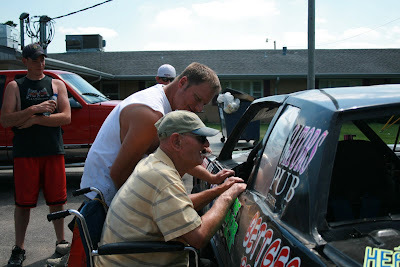 Greg Ekeler shows Exeter Care Center resident Dale Mizner the inside of his race car during a visit to the Care Center. Exeter Care Center resident Esther Deterding enjoys posing with her grandson, Greg Ekeler, in front of his race car. She also enjoyed attending the races at Junction Motor Speedway since Greg won the race that evening. 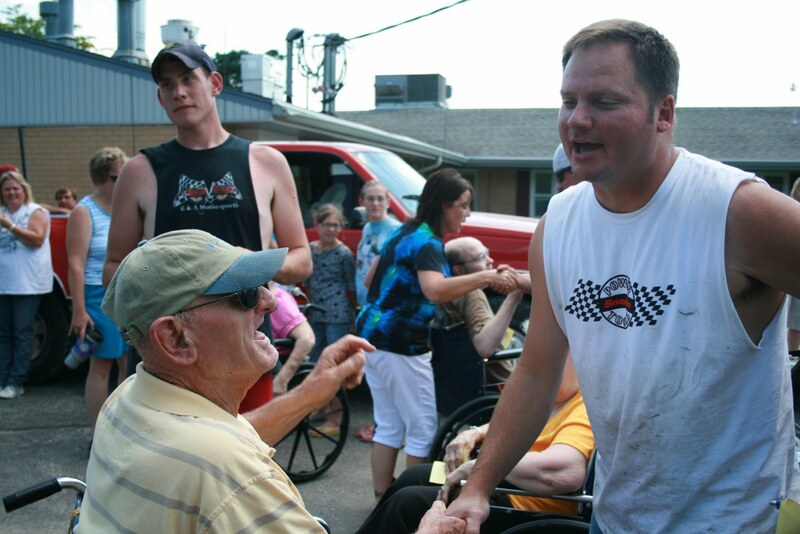 Dale Mizner reminds Greg Ekeler that he owes him a hat while looking at his race car at the Exeter Care Center. The roar of the engines, the screech of the tires and the smell of hot asphalt was all there at the Exeter Care Center Thursday afternoon. Four cars, all of which compete in the Cruiser category at local racetracks, paid a visit to the care center in preparation for the resident's visit to Junction Motor Speedway in McCool Thursday evening. The drivers which included Brian Petro and Clayton Lewis in # 71, Bill Lewis and Jim Lewis in # 11, Greg Ekeler and John Miller in #42 and Brent Kassik and John Miller in #59 brought their cars out to show the residents. The residents enjoyed asking questions about the cars and how these particular cars require two drivers, one to steer and the other to run the gas and the brakes. They also had the opportunity to look in the cars and get autographs from all of the drivers. 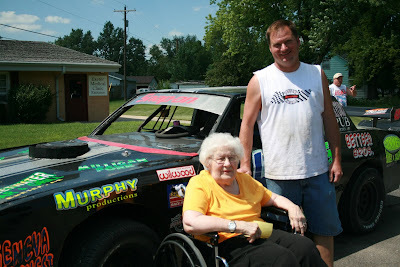 Several of the drivers have ties to the care center as driver Brian Petro is the son of Social Services director Margaret Petro and driver Greg Ekeler had the opportunity to pose with his grandmother, Esther Deterding, who resides at the care center. Bill Lewis in car #11 is the wife of Connie Lewis who works at the care center on the nursing staff. Julie Lewis who is also on the nursing staff has two drivers in her family, husband Bill Lewis in car # 11 and son Clayton Lewis in car # 71. After the races Margaret Petro reported that "Esther (Deterding) was tickled pink because Greg (her grandson) won - we got to talk on the microphone and everyone cheered. The residents had a great time."